Simon says, Would you like to play a game? Or seven? With Simon 2, the next generation of the classic electronic sequencing game, players can play the traditional Simon challenges against the machine or they can turn over the unit for head-to-head play with a human opponent. All seven games are variations on the ingenious original: an ever-increasing sequence of signals, denoted by the flashing and beeping colored buttons, must be repeated by alternating opponents. 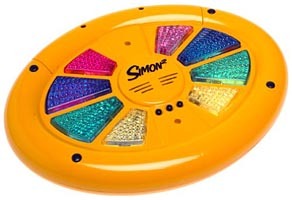 Complete with nonscuff rubber feet, and powered by three AA batteries, Simon 2 features adjustable skill levels on most of the games (a sequence of as few as eight or as many as 31, for example). Players who desire a dash of recall and replication with their reflex action will enjoy getting Simon, too.